Using near-infrared colors--some three times deeper in the red visible to the human eye--these images reveal the surface with unusual clarity. The left image shows a variety of surface features at a wavelength of 2.0 microns. The darker areas are possibly regions of relatively pure water ice, while the brighter regions likely have a much higher amount of non-ice materials such as simple hydrocarbons. 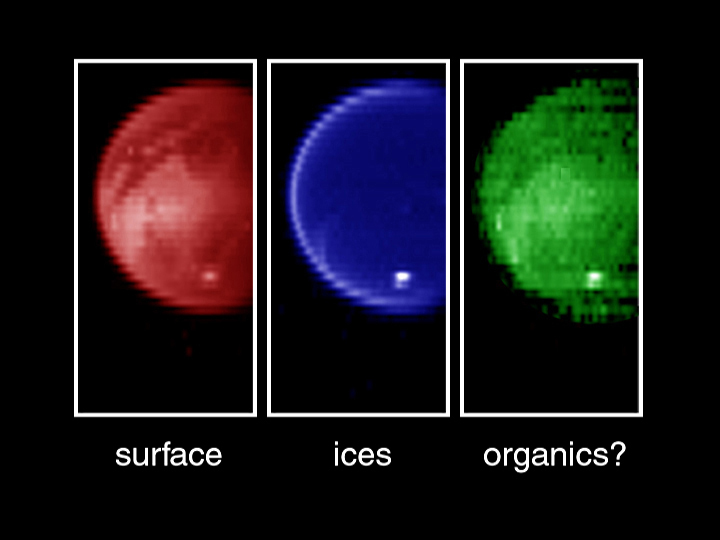 The middle image measured at a wavelength of 2.8 microns shows a very dark surface almost everywhere, as expected for a surface of water ice and simple hydrocarbons. The image on the right, taken at 5.0 microns, is similar to the left image, indicating dark icy regions and brighter hydrocarbon-rich materials. A bright cloud of methane particles is apparent in all three images near the south pole. It's persistence over an extensive range of colors indicates that these cloud particles are large compared to the typical haze particles surrounding the planet, suggesting a dynamically active atmosphere near the South Pole. Color was used to enhance the various wavelengths. The Cassini-Huygens mission is a cooperative project of NASA, the European Space Agency and the Italian Space Agency. The Jet Propulsion Laboratory, a division of the California Institute of Technology in Pasadena, manages the Cassini-Huygens mission for NASA's Office of Space Science, Washington, D.C. The Cassini orbiter was designed, developed and assembled at JPL. The visible and infrared mapping spectrometer team is based at the University of Arizona, Tucson. For more information, about the Cassini-Huygens mission visit, http://saturn.jpl.nasa.gov. For more information about the visual and infrared mapping spectrometer visit http://wwwvims.lpl.arizona.edu/.